Reporters and editors at the Capital Gazette quickly turned their heads around when the glass doors leading to the newsroom suddenly shattered. Within minutes, it "was like a war zone." "He was going down our newsroom, starting from the front and just continually shooting people," Phil Davis, a police reporter at the newspaper said. 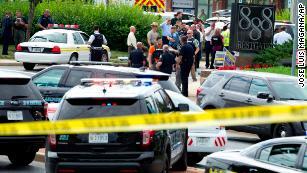 The shooting that marked the deadliest day for US journalism since 9/11, began when a gunman made his way through a brown four-story office building just a few miles outside downtown Annapolis -- the historic Maryland capital city. Armed with a shotgun, the gunman opened fire through the front doors of the newsroom around 3 p.m.
Four employees were killed at the scene; a fifth person, who was shot in the upper body and arm, died at the hospital. Keith Cyphers was on the phone with a client at his office across the hallway from the newspaper when he heard a loud noise and saw the gunman. "The door of the Capital Gazette had been blown to pieces. 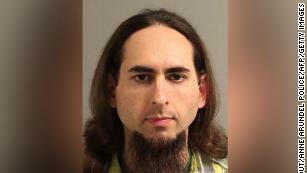 It was in shattered pieces all on the carpet and this guy was holding what looked like a big shotgun and moving across the entrance of the Capital Gazette office pointing the gun deeper into the office like he was targeting people," he told CNN affiliate WJLA. When the gunman walked inside, he could easily see the entire newsroom. Most of the staff were at their desks and the editors were in their offices lined up on the left. 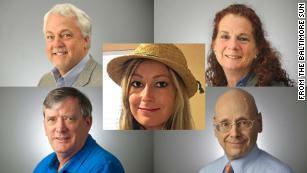 "It's a completely open newsroom," said Terry Smith, a columnist for the Capital Gazette. "There are glass windows all around the room. There is nothing except for a few half-walls at the editors' offices on the left to impede a shooter," he added. Another reporter, Selene San Felice, said she heard the first shots and grabbed her purse before heading to a nearby back door. Two other staffers and an intern who were also trying to get away joined her, but the door was locked. With nowhere to go, she hid under a desk with an intern. Another woman got behind a filing cabinet after falling to the floor. John McNamara, one of the five employees who died, kept trying to open the door. "I'm not sure exactly in the next couple seconds what happened, but I know that John was standing up," San Felice said. "I heard the footsteps, and John got shot. It was very close. I saw him get shot, but I didn't see the gunman or anything." There were no screams. It was all silence and the sound of gunshots traveling through the newsroom of one of the oldest newspapers in the country, reporters recalled. San Felice could hear the gunman's footsteps as she sat under a desk. She was praying and texted her parents to tell them that she loved them. Trying to go unnoticed, she also attempted to call 911. "I'm sure I was breathing really loud, and I was trying not to, but I just -- I couldn't be quiet," she said. Next to her, summer intern Anthony Messenger took his phone and tweeted, "Active shooter 888 Bestgate please help us." Davis who was also hiding under a desk said he wondered to himself, "Are we all going to die?" when he heard the gunman reload. "I'm a police reporter. I write about this stuff -- not necessarily to this extent, but shootings and death -- all the time," he told the Baltimore Sun. "But as much as I'm going to try to articulate how traumatizing it is to be hiding under your desk, you don't know until you're there and you feel helpless."